By: Che Hasruddin Che Hasan MONDAY, 22 FEBRUARY – Universiti Malaysia Sabah (UMS) through its corporate social responsibility (CSR)to rural communities to promote unity, strengthen mutual understanding and and reinforce the spirit of unity between UMS and the rural community besides inculcating the culture of syura and amal jama’i among university community. The combination of four main departments headed by the Registrar Department, Chancellery Department, Bursar Department and the Department of Information Technology and Communication that formed Al-Haaq, held a community project at Kampung Penimbawan, Tuaran recently, which showed the determination of the university in serving the surrounding community. 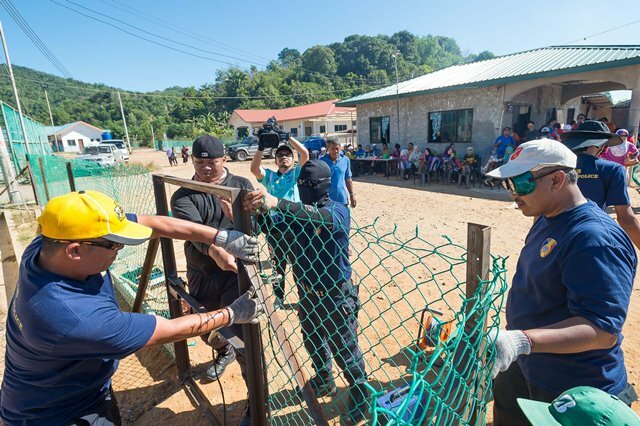 About 100 staff of UMS helped in repairing the KAFA building at the kampung that suffered a lot of damages, so that learning by the local children could be done in a conducive environment. Among the repair work done were painting of classrooms, whiteboard installation, fixing of windows and fixing as well as painting of the building’s doors. The fence surrounding the KAFA building was also fixed to prevent the learning equipment from being stolen, safer surrounding for the children and to avoid stray dogs from invading the property. The one-day programme was officiated by the Political Secretary to the Minister of Local Government and Housing, Sabah, Kassim Hj. Razali. He was grateful that UMS was always creating opportunities to be close to communities, and selecting a kampung under the purview of Datuk Seri Panglima Hj. Hajiji Hj Mohd Noor as the location for this charity project. “This is also an innovation by UMS because previously most charitable programmes were run by students but this time it involves the administrators and staff of UMS itself,” he said, urging that such programme should be continued for the development of the villagers. Meanwhile, UMS Registrar, No’man Hj. Ahmad said, UMS was always ready to engage with the community, especially when it involved the personal development of students. “UMS will help in whatever way we could to the villagers of Kampung Penimbawan. “It is our hope to see small children learn in a comfortable environment and can take advantage of this for the good of the people in Sabah,” he said. He also urged and encouraged the involvement of academic entities to participate in such projects. Kampung Penimbawan is located at Serusup Bay and can be accessed by waterway and land. However, most villagers prefer to use boats as their transportation means as it is closer and easier.